Totally my conclusion for the college remarks was EXCELLENT. It is a good tree for good future. 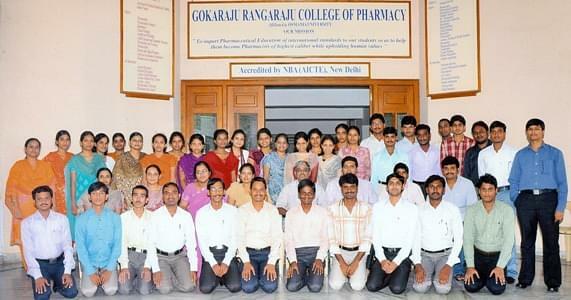 Yes, the college gokaraju rangaraju college of pharmacy is the only private college which is first accredited by NBA in andhra pradesh as well as in telangana states. The students out put of our college are able withstand any type of difficulties in their career and also in their personal life. Gokaraju Rangaraju College of Pharmacy is the college which is situated on the hill tops of picturesque and provides a calm landscape atmosphere which is necessary for learning. Its infrastructure has the growth with the state of art technology of the millennium. It has well equipped laboratories. Its mission is to achieve excellence records in pharmaceutical education by adopting ideas from both pharmacy and education. The college teaching staff is qualified and experienced with latest skills. It offers Bachelor of pharmacy and Master of Pharmacy courses in pharmaceutics, pharmaceutical chemistry, pharmaceutical analysis & quality assurance and industrial pharmacy. The vision of the college is the best institutions for pharmacy with attitudes, skills and knowledge and to impart pharmaceutical education of international standards to the students.